I avoid interacting on Slack, especially for technical conversations around open source software. Instead, I encourage colleagues to have technical and design conversations on GitHub, or some other system that is public, permanent, searchable, and cross-referenceable. In the spirit of Don’t Repeat Yourself (DRY) I’m writing up these thoughts as a blogpost. Slack is a great tool. Slack is a great way for colleagues within an institution or group to communicate real-time with chat, voice, or video. Slack is probably the most polished of the enterprise chat tools, and today is something that probably most companies and collaborations should use. However internal real-time chat systems are, I think, bad for productivity generally, especially for public open source software maintenance. Real-time chat systems make everyone feel productive (it’s fun to have a face-paced technical conversation with colleagues), but do relatively little for long-term community consensus building, particularly when the users and developers of a project span a variety of institutions and a long range of time. External collaborators may have the answers that we need. Having the conversation in a private place means that we can’t ask them for their help, or, if we do eventually need to ask them for help, we need to summarize the entire conversation that we’ve had privately, which wastes time. Individual open source maintainers often don’t know the answers that people ask, but they do know how to redirect to someone who does. More often than not, that person is in another institution. If you ask your question on GitHub this redirection is easy. External collaborators may have questions or context that we need. Their questions and experience can help us create a better product than we’re capable of producing with only our in-house expertise. Most important problems are useful across many organizations, while solutions built within one organization are often overly-specific to the needs of that organization. By getting broader context, OSS has a much higher likelihood of success. External collaborators are much more likely to buy in to whatever we come up with if they were able to see the reasoning behind it and participate during that conversation. 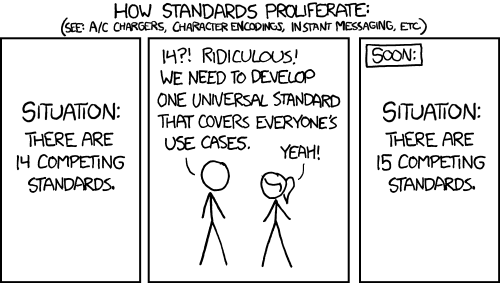 If you open the design process to the creators and users of the previous 14 standards, the 15th standard has a much higher probability of actually being used. As we adopt community maintained open source software, the team we work with extends beyond our institution, and beyond the people who listen in to all of our institution’s Slack conversations. Slack: We had a conversation about this a while ago and decided that it was the right course of action. Just go with it. GitHub: Go look at Issue #1234 and you’ll be able to see the reasoning why, who had which opinions, and whether or not your concern was raised there. If your concern wasn’t raised there then we can easily pick up that thread of conversation on GitHub a year later (this happens all the time in long running OSS projects). Even in the same group we often find that people repeat the same conversations. If there is an obvious place for that conversation, and you need to scroll through previous comments, then it’s far less likely that people will have to repeat themselves. On Slack, maintainers get asked the same questions daily. We have people ask for “a few minutes of our time” every few minutes. We strongly prefer to answer questions once in a place where future users can find the answer from a web search. This includes people outside the company, but also people within the company. Maintainers are much happier devoting a lot of time to craft a high quality answer to questions if those questions and answers can help others in the future. I personally spend a lot of time crafting answers on Stack Overflow, while I usually ignore questions on chat systems. Want a good answer? Pose a good question in a public place. Encourage thoughtful discourse. Because GitHub is a permanent record it forces people to think more before they write. This is hard on casual conversation, yes, but we’re not here for casual conversation. Asking people to spend a minute crafting comments generally results in a conversation that is higher functioning, more concise, and much easier to review later. Cross reference issues. Slack is siloed. It doesn’t allow people to cross reference people or conversations across Slacks. OSS maintainers get invited to literally dozens of Slack organizations. It is not feasible to manage dozens of Slack tabs and different siloed organziations. GitHub is public and conversations across different projects can easily cross reference each other. This encourages collaboration between projects and avoids wheel-reinvention. Slack is the easy choice. It’s so much easier just to open up a one-on-one conversation with someone, chat with them for a bit, get your answer, and feel like you’ve had a productive experience. It feels good, but is rarely the correct choice long term, especially when you add up how many times that same conversation occurs. Putting in a bit more effort and starting (or continuing!) a well-posed conversation in a public issue tracker like GitHub is likely better for your project and for your teammates long term. I still love Slack for inter-personal contact. It’s great for chatting with teammates, checking in to see how people are doing emotionally, or sharing pictures about our lives. Professionally I think it’s also a good place for internal teams to do daily check-ins and sometimes to arrange short-term priorities. Slack has many great uses, but I think that in-depth technical conversation and long-term planning aren’t among them.